Home Tags Posts tagged with "virtual army"
Balmain recently announced that their new campaign features virtual models. The brand actually designed digital models, by working with the software company CLO Virtual Fashion. The company has its 3D designers input data from each item of clothing, into a program and tailor the dresses to each model’s measurements, after measuring the clothes for weight, flexibility, drape and stitching patterns. 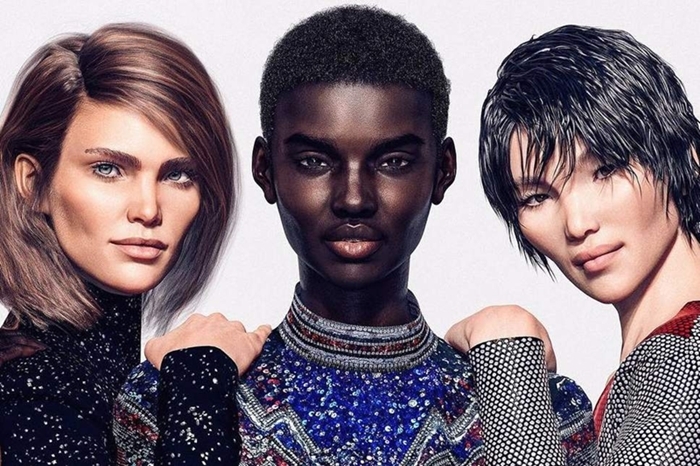 The new virtual “Balmain Army” consists of 3 “models”, Shudu, Margot and Zhi. Shudu even has an Instagram account with over 100k followers, after Fenty Beauty reposted one of her photos. She was created by visual artist, Cameron-James Wilson. The reveal of her not actually being real, received mixed reactions. While some users found it artistic, and smart, some others thought it was “just not right”, since virtual models can’t compare to real life models. According to Balmain’s statement about the models: “Anyone and everyone is always welcome to join Balmain army’s growing ranks – they need only share our bold spirit of adventure as our new virtual icons, Margot, Shudu and Zhi who mirror the beauty, the rock style and the confident power.” The 3 virtual models, are exclusive to Balmain and were made in a collaboration between Rousteing and CGI artists. What do you think about this move? Are you a fan of the idea?